It’s now early April and the refurb of the flat we bought in early January is still incomplete! It should never take this long but I’m resigned now. It’s only a small job: Muck out, reconnect stolen electric and gas mains, repair front and internal doors after break-ins, re-fit old kitchen and several ceilings to re-board and skim after flood, repair holes in plaster walls, a couple of new windows, clean everything, redecorate and floor coverings. About £4K. For the first few weeks we deliberately left it fallow, with Sitex steel shutters outside, to deter other buyers as we hoped to buy the top flat for C£30K. But when someone else bought blind we moved on the refurb. The mains cables had been stolen so first we’d need power on. We spent three whole mornings trying to arrange power reconnection, and two whole afternoons waiting for workmen who didn’t arrive. Since de-nationalisation there are different bodies for generation, metering and transmission. They each said the others were responsible, it was impossible to know who was right or get them to communicate with one another. It was a merry-go-round between call-centres with no resolution. In the end I realised it was a Catch 22 – they won’t reinstall till it has a cert, and you can’t get a cert without power. I gave up on Npower/ E.on/ Powergen and daisy-chained a cable from the squatted house next door in exchange for a tenner a fortnight. We had a pair of skilled Polish workers booked in so I set off happily to start a friend’s renovation job in Devon. I’d been skeptical about the Polish workers, they were on just £40/£50 day, but their previous work was good. It sounded like exploitation, but it wasn’t. I never met them but they were normally kept on a very short leash by a Mr Ali. Unfortunately Ali had to go to Pakistan and without his steadying influence and they ran feral on drugs and alcohol. They were caught on CCTV stealing from a client and sacked. After that I didn’t want them no matter how cheap they were. So that left us to organise English tradesmen at short notice. No big problem with our contacts, and my business partner (BP) said he’d take care of it while I was in Devon. Shortly afterwards his 91-year-old father was taken ill with a groin infection rushed to hospital in Essex. My BP left to be at his side. He came back after a few days, but left again shortly afterwards and has shuttled back and forth several times in quick succession as his father was found to have a perforated ulcer needing four pints of blood, then caught pneumonia. It must have been nightmare for him as a man of this age could easily have died. holes in wall for stolen cables and gas pipes near top left. basement pipe re-instated. By the time I realised it might not happen unless I ran it myself I was already committed to the renovation in Plymouth. We’d gutted the place and had to put it back quicksharp for his new tenants so I can’t leave without letting him down. We’re still doing the flat in fits and starts, the wiring is nearly done, I’ve repaired all the doors and boarded the ceilings and they’ve been plastered. 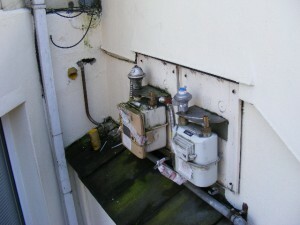 My BP is Gas-Safe registered and is re-instating the stolen gas pipes. The windows have arrived on site and are waiting to be fitted. We still have to finish building a cover for the mains wires and pipes to stop theft recurring, re-fit the old kitchen, decorate, and cover the floors. Fortunately we got it so cheap we can easily absorb the lost rent without making much of a dent in our discount/ profit. But I don’t like it.